The following question was posed to the Darul Ifta of Jamia Binoria Karachi for a clear ruling on the Islam of Aga Khani, Dawoodi Bohras and the Shia. 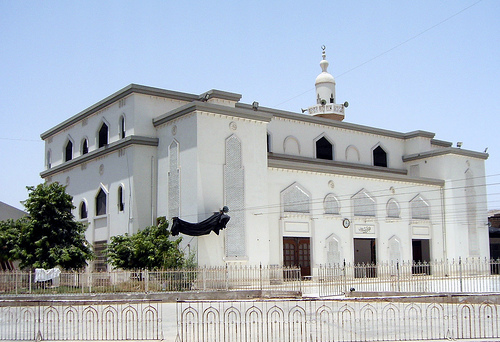 Darul Ifta Binoria did not put forth an outright ruling on the Twelver Shia and put down several conditions for the different sub-sects within Twelver Shia. However, concerning the Aga Khani cult, a clear stance was presented as the ijmaa of the scholars of the Muslim ummah. Read below for the complete English translation and the scanned original ruling in Urdu. Question: Are Bohris, Shia and Aga Khani sects included in the definition of Muslims? 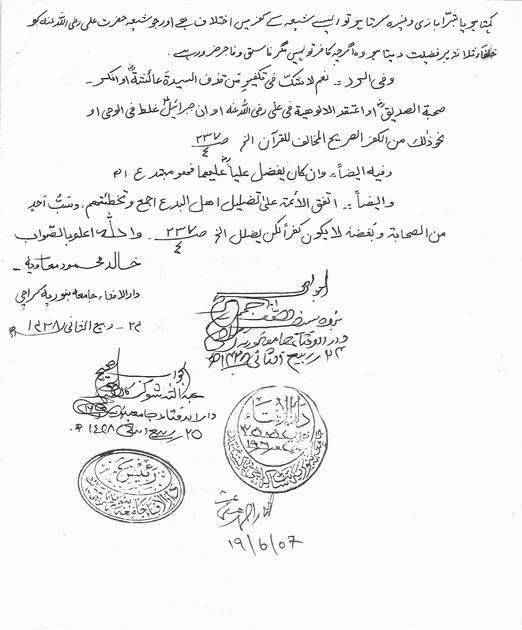 Answer: Popular sects Bohri and Aga Khani, due to their false beliefs and views are out of the fold of Islam and considered as two branches of rawafidh who hold beliefs such as corruption of Qur’an, permissibility of alcohol and fornication, and in the kufr of companions of Prophet (pbuh) other than the rightly guided caliphs. Due to this, there is an ijmaa of the Ummah on these sects being zindeeq; and one should abstain from keeping friendly relationships with them. Those Shia who believe that Ali (ra) is Allah (swt), that the Qur’an is corrupt, that archangel Gabriel made a mistake when bringing revelation from Allah (swt), that Aisha (ra) was correctly accused, that Abu Bakr Siddiq (ra) was not a true and honest companion, or holds any such belief which is in direct opposition to Qur’an, then there is no doubt in his kufr. However, any Shia who does not hold the above beliefs but accuses the Companions (ra) of wrongdoing, then there is a difference of opinion of scholars on such Shia. The Shia who believe that Ali (ra) was most virtuous over the other three Rightly Guided Caliphs (ra), are is not declared kaafir but are considered promiscuous and immoral due to holding such beliefs. It is worthwhile mentioning here that Twelver Shia themselves do not consider Aga Khani Ismailis as Muslims and their Grand Ayatollah Muhammad Hussain Najafi has declared them out of the fold of Islam. The fatwa by Allama Muhammad Hussain Najafi can be found here. 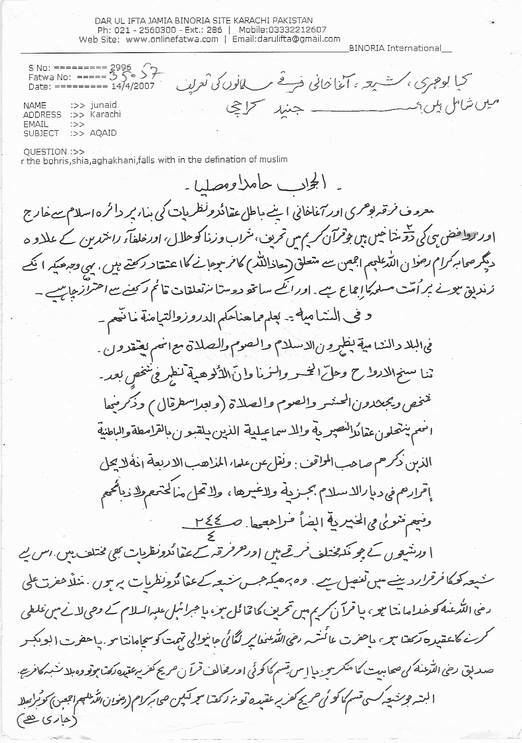 Another ruling of prominent Sunni scholars such as Mufti-e-Azam Pakistan Mawlana Wali Hasan Tonki and Mawlana Yusuf Ludhiyanvi, and reputed organizations such as Darul Ifta Nazimabad and Darul Uloom Karachi-14 has been compiled by Shaykh Faiz Ullah Chitrali in the form of an Urdu booklet called “Aga Khan Foundation and the Ruling of Scholars”, which can be found and downloaded from here. As salam alaikum, I hope you’re fine there. Maasha’Allah good post. I really like and appreciate your efforts for exposing Ismailiam (agha khaniyat). May Allah (s.w.t) give your strength to continue this great work and protect you from all evils and evil people, aameen. Further, I also posted few tweets some days ago concerning islamic ruling against ismailis (agha khanis, bohris), rawafiz (shia), qadyani etc, please read and, if you like, refer my those tweets too. Jazak Allah Khair. Will do so immediately. Ismailis do not have anything to do with Shia Islam. Stop pretending to the world that you are Shia, because you are not, and all Shia scholars agree on that.